The Central Highlands is the heart of Tasmania. It covers 8,010 sq km, roughly 12 percent of Tasmania’s land mass. It’s home to a permanent population of 2,216 and thriving communities disparately located around the region’s spectacular lakes and mountains. Life in the Central Highlands is all about glorious scenery, fantastic trout fishing, and dramatic heritage. It’s home to a World Heritage Area, two national parks, and other Wilderness Conservation Areas. You can hunt, bush walk and fly fish and enjoy a strong agricultural, horticultural and tourism environment. But before you break ground for your new kit home, there are 6 things you need to consider before you start building. Development within the Central Highlands Council area is governed by the Building Code of Australia and the Central Highlands Planning Scheme 1998. Visit the Bothwell Office at 19 Alexander Street for application forms and further information. Category 1 (low risk building work) – can be undertaken without a permit by an owner, or competent person, or licensed builder. Category 2 (low risk building work) – can be undertaken without a permit by a Licenced Builder (or a competent person only where specified). Category 3 (notifiable building work) – Work that is considered to be medium risk requires a Certificate of Likely Compliance from a Building Surveyor. The permit authority is notified of this work but no Building Permit is required. Category 4 (permit building work) – High risk building work requires a Certificate of Likely Compliance from a Building Surveyor and a Building Permit issued by the permit authority. More information and all your forms can be found here. The Central Highlands region isn’t easily described. It’s a land of three thousand lakes (hence why it’s also known as The Lake Country) and includes Australia’s deepest freshwater lake (Lake St Clair) and Australia’s largest freshwater lake (The Great Lake). 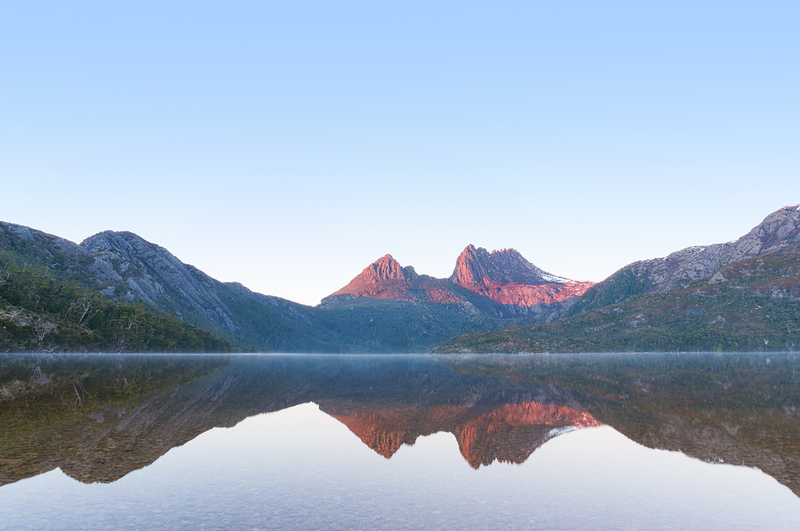 It’s a land of raw wilderness within the World Heritage listed Walls of Jerusalem National Park, which borders the iconic Cradle Mountain. So vast is the mountain range that weather can produce four seasons in one day. Building with climate in mind takes some careful thought. The Central Highlands contains the highest-altitude of Tasmania’s landmass. As such it has cooler temperatures and a larger daily temperature range than the coast. Nighttime temperatures are generally cold with frost over winter. The annual average is 9 degrees celsius so be sure your home will keep you warm. The municipality has a strong seasonal cycle (driest in February and wettest in August) and rainfall can be as high as 1600mm annually in the west. The eastern part of the municipality sees significantly less rainfall, with less than 600 mm annually. Rainfall is projected to decrease in the Central Highlands by up to 10%, indicating that drought frequency and severity may increase over time. Although not significant in terms of property loss, bushfires in the Central Highlands have had devastating effects. In 2016 the impact bushfires had on the region and the World Heritage land was catastrophic. Some 18,000 hectares of heritage area was affected. For information regarding bushfire prone areas, click here. A bush fire prone area is land that is within the boundary of a bushfire-prone area shown on an overlay on a planning scheme map or land that is within 100m of an area of bushfire-prone vegetation equal to or greater than 1 hectare. For information regarding flood mitigation in the Central Highlands, click here. To view Meander Valley Local Provisions Schedule Flood-Prone Areas and Fire-Prone Areas Overlay click here. The Land Capability Classification System is based primarily on three permanent biophysical features of the landscape – soil, slope and climate, and their interactions. These three factors have a major influence in determining the capability of the land to produce agricultural goods. Other factors which must be taken into account are rock type, erosion hazard, range of crops that can be grown, management practices, soil conservation treatment, risk of flooding and past land use history. The classification takes into account physical limitations the land may have, an example being poor internal drainage, rock outcrops, slope or stoniness. Limitations can be classified as either permanent or able to be removed or modified. Observing your local bush is a good way to get an idea of what can be grown in your area and what is suited to your property. Score plants against soil type, vegetation, community and uses. Native plants occurring naturally in an area are adapted to survive and thrive in local environmental conditions. Choose local species when landscaping your kit home and you are more likely to have a successful planting site. You’re also helping to preserve any natural variability within that species and provide habitat for birds, insects and mammals in your area. Try collecting your own seed or visit your nearest native plant nursery. Check out this guide to suitable plant species too. As a result of significant reform of Tasmania’s water industry all regional water and sewerage suppliers moved to a single corporation in 2011, TasWater. Specific governance arrangements were agreed that are now largely incorporated in the Water and Sewerage Corporation Act 2012. The objectives prescribed in the Act are to encourage water conservation and deliver water and sewerage services to customers in the most cost efficient manner. There’s a lot to consider when building a home, and the more you can tap into the expertise of others the smoother the process will be. Download a Kitome brochure today and start planning your dream home. Take a look through our collection of 50+ kit home designs, which includes sprawling homesteads architecturally designed to sit perfectly in the rural setting, generously sized family homes suitable for regional and suburban blocks, and smaller homes for the cosy holiday retreat. All of our kit home designs are 100% customisable, which means you can alter any design how you want. Get in contact with us to learn more.